Mooshroom Cow are pasive animals which wander mushroom biome. It is a variant from the Cows. They have red skin with grey dots and they have mushtrooms on its back. What is special from this creatures is that you can shear them and obtain red mushrooms. Moreover you milk them with a wood bucket to obtain mushroom soup. If you milk them. If you milk with an iron buket you will obtain just milk. Mushroom Cow’s behavior is the sam as normal Cows, just that they grow from the mushroom biome. You can breed Mushroom Cows feeding with wheat, the same as Cows. Mushroom Cow’s always follow their cow babies, however if you shear them, they will leave the babies alone so they will grow as normal cows. This animal appears only in the Mushroom Biome which is a biome with low generation rates. 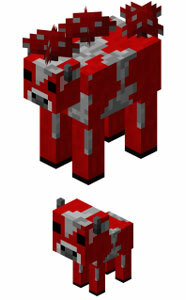 So this will be a creature difficult to find in the Overworld of Miecraft.